They may have been intended by Prime Minister Nuri al-Maliki as another piece of strongmanship that would strengthen Baghdad’s central government, but the recent operations by Iraqi government forces against the Iranian opposition group Mujahedin-e Khalq (MKO) at Camp Ashraf in Diyala governorate have been greeted in a way that suggests wider regional political dynamics. Using rhetoric that is a carbon copy of that employed by the Iranian regime, Sadr al-Din al-Qubbanji and Jalal al-Din al-Saghir, two old Khomeinists and leading preachers of the Islamic Supreme Council of Iraq (ISCI), today hailed the operations against the munafiqin or “hypocrites” in their Friday sermons in Najaf and Baghdad respectively. (The MKO are a remnant from Iraq’s Baathist period, when they were Baghdad’s favoured Iranian opposition group.) For his part, Iran’s parliamentary speaker Ali Larijani welcomed the action taken by the Iraqi government, while MKO representatives characterised the manoeuvre as an operation directed from the very top of the Iranian regime, intended as a diversionary tactic by a government that remains under heavy domestic pressure after the recent presidential elections. It should be added that the Camp Ashraf operations took place simultaneously with the visit to Iraq by the US defence secretary, Robert Gates. Many commentators find faults with Sadr al-Din al-Qubbanji, a leading preacher of the Islamic Supreme Council of Iraq (ISCI), but whatever the critics may say, the man is certainly in the habit of speaking in a frank and unambiguous language – something that occasionally is in short supply among the Shiite Islamists of Iraq. So too yesterday, when Qubbanji told worshippers in Najaf that a regional conspiracy headed by Saudi Arabia was underway to disrupt the “Shiite–Kurdish” alliance in Iraq, possibly by destroying the Shiite-led United Iraqi Alliance (UIA) and replace it with something else. But hang on a second: Was not the “new” UIA meant to transcend this outdated language of sectarianism? Apparently not. Of course, there has been evidence of this for some time, but Qubbanji’s clarification of the essentially ethno-sectarian orientation of the UIA is useful at a time when many other Iraqi political forces are considering how to frame their alliances for the 2010 parliamentary elections. Also yesterday, another UIA figure, Khalid al-Asadi, reiterated the line-up of the “new” UIA, as had been leaked earlier in the week as well: Daawa, ISCI, Badr, UIA independents, the Jaafari breakaway faction of the Daawa. And, according to a report in the pro-Shiite newspaper Al-Bayyina al-Jadida, Ahmad Chalabi was meeting with Ali Larijani in Tehran to consult on Iraqi affairs. During yesterday’s brief press conference in Washington, Barack Obama found back to some of the good ideas from his first Iraq speech in February. He reiterated his respect for the way Iraqis had shown resilience against the forces of division, and he talked about national reconciliation in a relaxed fashion that did not impose particular parameters for the process. At one point he mentioned “all of Iraq’s ethnic and religious” groups, but in another instance he referred to the “people of all parts of Iraq” and there was no reference to the specific tripartite formula of “Shiites, Sunnis and Kurds” which was prominent only weeks ago during Vice-President Joe Biden’s visit. All in all, his remarks are likely to be seen as unobjectionable by a majority of Iraqis, quite regardless of what they may think of the current Iraqi government. We do not know what was said behind the scenes, but it is quite entertaining how the Western mainstream media, by contrast, remain stuck in their own clichés. Here, reconciliation “between Shiites, Sunnis and Kurds” is the only ticket in town, even if this means having to struggle with quotation marks and sometimes even cheat. For example, in a story published yesterday morning, prior to the conference, AP reported, “U.S. 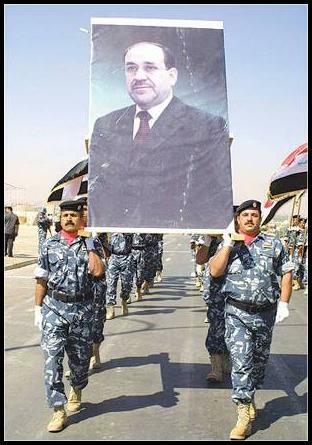 officials, while praising improvement in Iraqi security forces, remain deeply concerned that al-Maliki’s Shiite Muslim-dominated government has been unable or unwilling to reconcile with the country’s minority Sunni Muslims and Kurds.” (Not a single quote was provided.) Then, after the press conference, another paragraph was added to the story – this is after all the normal way this cut-and-paste industry works. It read, “President Barack Obama said he pressed Iraq’s prime minister on Wednesday to make room in his government and security forces for all ethnic and religious groups to prevent a resurgence of the violence and turmoil that took the country to the verge of civil war.” Of course, at no point had Obama referred to anything to do with cabinet or indeed security forces composition (only that the latter would have to behave in a non-sectarian fashion in order to continue to receive US backing). The BBC was even worse. The 1900 GMT evening bulletin of world news started just before the press conference in DC and featured an interview with the Washington correspondent of the BBC, Jon Donnison. He maintained that Obama would work very hard to secure tripartite reconciliation, and he was particularly adamant that “dividing up the energy resources” between the three was key. Immediately following the live coverage of the press conference, Donnison was given another chance to offer his exegesis; this time he focused on Obama’s reference to “all of Iraq’s ethnic and religious” and then added, “I take that to mean that he wanted assurances for the Kurds and the Sunnis”! In the 2000 GMT bulletin, Donnison had grown even bolder. He now claimed that “Obama said” he was looking for changes that “better integrate Shiites, Sunnis and Kurds”. Nothing of the sort had of course been said during the press conference. But the BBC persevered with its peculiar and highly tendentious mix of fact and fiction. In its website version of the story today, it erroneously attributed the tripartite theme to Maliki: “…‘The sons of Iraq and the daughters of Iraq will be equal’, Mr Maliki said, vowing that the country’s national unity government would work to end often bitter divisions between Iraq’s Shias, Sunnis and Kurds.” Except that the “vow” was the BBC’s own invention. The subtle shift in public discourse may or may not reflect a conscious change on the part of the Obama administration about how to handle reconciliation in bilateral talks with Iraq, but in any case none of what was said publicly in the Rose Garden yesterday corroborates the “interpretations” offered by AP and the BBC. Meanwhile, based on Maliki’s remarks at the press conference, we are coming closer to an identification of where US leverage in the bilateral relationship with Iraq actually exists: in the Iraqi quest to bring to an end the “Chapter Seven”-imposed war reparations which Baghdad still has to pay Kuwait to compensate for the 1990 invasion. A change to this would require a UN Security Council decision, and the US could probably do more to lobby other states. Why not use this constructively? Why can not the US say publicly that it wants to help Iraq get rid of the Chapter Seven burden, but that it wants reassurances that Iraqi reconciliation is indeed taking place, and that it would be far easier to help Iraq once a process towards meaningful constitutional revision (again, in general terms, not imposing any particular vision) gets going, perhaps in the context of the upcoming parliamentary elections? To establish this link in general terms would be a lot more helpful than the more specific ideas of “tripartite concord” offered by Biden earlier this month, and would also be more faithful to the spirit of Obama’s remarks yesterday and indeed his whole project of not imposing particular agendas on other countries. As Nuri al-Maliki visits Washington today, he already seems to be under a lot more of pressure than only four months ago, when he was celebrating the quite spectacular success of his “State of Law” list in the January local elections. Back then, he was involved in what seemed to be real efforts to establish a genuine cross-sectarian alliance with secularists and political movements in the Sunni-majority areas of Iraq, and was talking openly about reforming “weaknesses” of the 2005 constitution that were due to the “chaotic” environment in which it had been adopted. But then followed a string of high-level visits from Iran, heavy anti-Baathist rhetoric from the Islamic Supreme Council of Iraq (ISCI), a spate of unexplained bombings in core Shiite areas, the election of Ayad al-Samarrai to the speakership of the parliament, and finally a visit to Baghdad by US Vice-president Joe Biden that seemed aimed at getting the Iraqis to once more think of themselves as three separate ethno-sectarian constituencies in need of American assistance to achieve some kind of grand political concord. And voila, these days Maliki is no longer talking about new alliances, but instead is focusing on refurbishing the Shiite sectarian alliance of the past, the United Iraqi Alliance (UIA). It was announced two days ago that the new and supposedly more “nationalist” UIA had agreed on its basic principles, but the identity of the signatories – the two Daawa branches, ISCI, the bloc of UIA independents, and, maybe, the Sadrists (some Sadrists dismiss this last bit) – emphatically suggests that this is old wine in new bottles. Not exactly Hammurabi: Nation building courtesy of the US Army is both recession-prone and fragile. 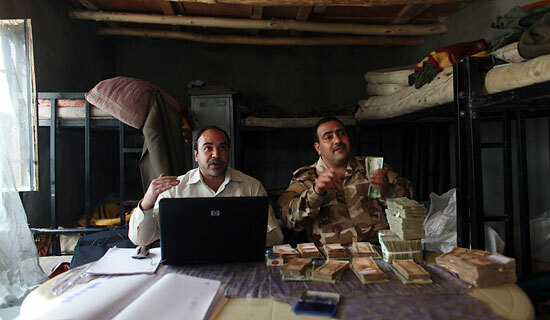 This photo shows Sons of Iraq leaders preparing payments for its members in March 2009, supposedly to achieve “greater inclusion of the Sunnis in the new Iraq”. From the point of view of nation building, it will be a bad thing if Maliki’s leaves DC with the impression that all the outside world expects from him is a little bit more leniency when it comes to the integration of the Sons of Iraq militias (apparently Pentagon’s idée fixe in the area of national reconciliation), as well as a slightly less confrontational approach to the Kurds over Kirkuk (the only other constitutional issue which seems to command major attention in Washington these days). Together with all the other developments over the past few months, that kind of message from the US could easily turn Iraq’s 2010 parliamentary elections into a carbon copy of those which took place in a sectarian climate back in 2005. After weeks of speculation that their party was headed for reunification with the United Iraqi Alliance (UIA) in a supposedly new and nationalist incarnation of the Shiite bloc, Fadila leaders have now publicly said they have no such intentions. Both Hasan al-Shammari and Basim al-Sharif have said that the political programme and the overall orientation of the UIA remains the same as it always was, and that Fadila is continuing to seek other partners on a nationalist and non-sectarian basis. At the same time, however, the driving force behind the reunification, the Islamic Supreme Council of Iraq (ISCI), seems to be making headway on two other tracks that could prove more consequential in the long run. First, its campaign to terminate dialogue between Nuri al-Maliki and secularists of various calibres (including supporters of the former regime) seems to have produced results. Whereas Maliki only months ago talked about “alliances” (in the plural), these days he, too, seems more focused on the issue of how to revamp “the alliance” (in the definite singular form, meaning the UIA). Second, reports out of Tehran suggest that Muqtada al-Sadr has met with Abd al-Aziz al-Hakim, also for the purposes of revitalising the Shiite alliance. If confirmed, this would be another partial victory for ISCI, even if local Sadrist leaders in Iraq keep talking about “preconditions” and “reservations” regarding the sectarian orientation of the UIA. In an attempt to clear up the confusion between real cross-sectarian alliances and sectarian alliances with quasi-nationalist appearances, Rashid al-Azzawi, a member of the Iraqi Islamic Party (IIP), in an interview with Al-Sabah al-Jadid has made the point that any new credible national coalition should include established parties from both sides of the sectarian divides (instead of being a mere collection of parties from one side with some added figureheads of the opposite sect). For his part, fellow party member (now ex-member) Nur al-Din al-Hiyali is apparently trying to take a page out of the Mosul-based al-Hadba’s playbook by launching a locally focused nationalist movement, the United National Association for Nineveh Governorate, which will work to preserve the governorate’s territorial integrity in the context of challenges from the Kurds. This approach proved to be a vote-winner for al-Hadba in the January local elections, and it might turn out to be a safe bet for a cluster of seats in the upcoming parliamentary elections too. On 30 June 2009, StatoilHydro participated in the first licensing round for the Iraqi oil sector. No contract materialised after the bidding but StatoilHydro has expressed a continued interest in doing business in Iraq. The whole episode raises fundamental questions about the Iraq policy of Norway’s government, which owns the majority of shares in StatoilHydro… Full story here. The first licensing round for Iraqi oil produced surprises and what many analysts describe as a “meagre” outcome: Only one out of eight oil and gas fields was awarded, the supergiant Rumaila field in the Basra area where a service contract was won by a consortium of BP and the Chinese CNPC. The deal followed negotiations after an initial rejection by the Iraqi oil ministry of the first offer by the Sino-British alliance. Similar situations emerged with respect to all of the other fields (except Mansuriyah gas field in Diyala for which there were no bidders), but in all of these other cases the bidders refused to climb down to the price level demanded by the Iraqi government. With all the controversy surrounding the first licensing round, this may actually be a pretty healthy outcome. With his tough demands, oil minister Shahristani made it clear that he was at least not selling the crown jewels of Iraq’s oil wealth cheaply, although the fact that not even the Chinese were prepared to accept the fees offered by Iraq for the other fields suggests that he may have gone somewhat too far (Beijing is thought to be particularly interested in expanding its role in Iraq). Nevertheless, if the net outcome of the process is service contracts for some but not all of these fields, then it will amount to a compromise which both pro-government forces and sceptics may be able to accept. After all, it was the totality of the implications of the licensing round and particularly the prospect of a massive invasion of Iraq’s oil sector by foreigners that prompted resistance to the process. Most Iraqis agree that there is room for the IOCs in Iraq’s economy, albeit not in such a prominent capacity as that foreshadowed by the initial scenarios for the licensing round. As the Iraqi government and the bidders in coming weeks come together to seek compromise for the remaining fields, Shahristani has a unique opportunity to acquire much-needed legitimacy to his package of deals – partly by limiting the overall number of fields that are awarded, and partly by bringing in the parliament, the South Oil Company and other Iraqi oil experts.